1 of 5 Heat oven to 350 degrees . Line muffin tins with paper liners. Sift first 6 ingredients into a large bowl. Add eggs, 3/4 cup warm water, buttermilk, oil and vanilla; mix until smooth. 2 of 5 Divide batter among muffin cups, filling each two-thirds full. Bake until toothpick inserted in center comes out clean, about 20 min. Transfer cupcakes to a rack and let cool. 3 of 5 Meanwhile, make glaze: Heat cream in a small saucepan over medium. Place chocolate and corn syrup in a small bowl. Pour cream over chocolate mixture and let stand 2 min. Whisk until smooth. 4 of 5 Dip tops of cupcakes into glaze, shaking off any excess. Let set 10 min. 5 of 5 Make icing: Whip butter in a medium bowl until light and fluffy. 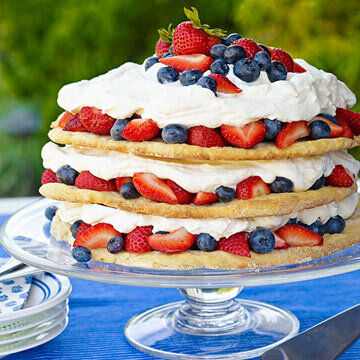 Gradually add confectioners' sugar until incorporated. Add milk and whip until fluffy. (If too stiff, add more milk.) Place in a pastry bag with a small round tip. 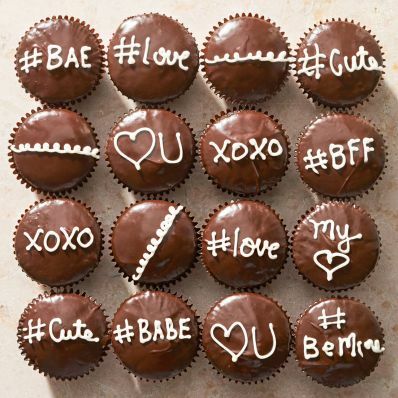 Write messages on cupcakes. Makes 2 dozen. 1 of 2 There are two ways to thin out your ganache frosting if it gets too thick: Try stirring in a little warm heavy cream until it loosens up, or gently reheat it in a double boiler set over simmering water, stirring until smooth. 2 of 2 To get neat lettering on the cupcakes, skip that fourth cup of coffee! Also, pick up a small writing tip (the smaller the opening, the better). For simple squiggles, snip a small corner off a quart-size plastic bag and go nuts.